Microfilament brush design delivers 90,000 filament sweeps per second. The patented micro-filament bristles are one-half times as thick as the bristles on other power brushes. This enables them to comfortably remove plaque in the difficult-to-reach sub-gingival and inter-proximal areas. 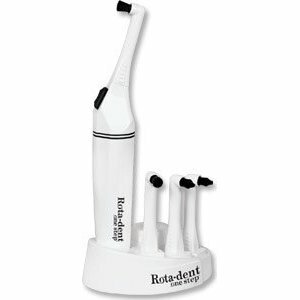 The Rota-dent one step® is clinically equal to brushing and flossing combined!